Welcome to a Cumbrian winter. The hilltops had been stolen and the landscape was bathed in grey as I jemmied my car into the compound at Lune viaduct, focus of a recent £600,000 refurbishment by BRB (Residuary) Limited. Lune is one of three listed viaducts on the former Ingleton branch. Lune is one of three substantial structures - all of them now listed - on the former Ingleton branch, a 19-mile connection between the West Coast route near Tebay and a junction at Clapham. No, not that one. Had it not been for the bickering of two railway giants, the Midland and London & North Western, it would have formed part of the shortest main line from Yorkshire into Scotland. Instead the Midland took its bat home and drove the Settle & Carlisle through hills further east, relegating the branch to a role of humble community servant. And it didn’t perform that particularly well. Ingleton village is still home to an 800 feet long viaduct, bridging the River Greta. Locals once spurned the Board’s offer of a walkway across its deck. Further north, motorists on the M6 can glimpse the colossus that is Lowgill viaduct. Lune stands between these two, close to Sedbergh, where the valley is narrow and steep. 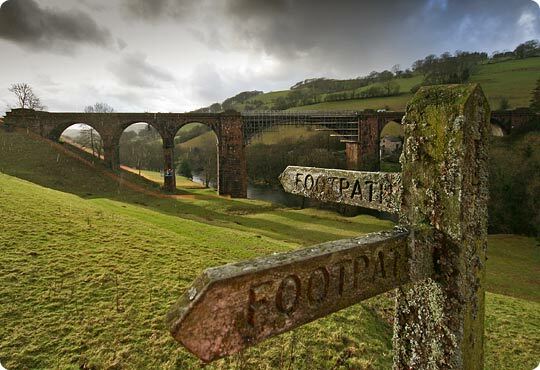 Comprising side-spans of Penrith stone and an elegant cast-iron central arch, it carried the track 100 feet above the river. installed across the main span. Known locally as Waterside, it was the major engineering feature within the second of four construction contracts, awarded to Coulthard & Allen by the Lancaster & Carlisle Railway in 1858. History records a great many accidents during its erection. On 1st July 1859, William Taylforth put his crane into gear instead of engaging the brake - an error which he paid for with his life when part of the mechanism hit him. Nevertheless, Colonel William Yolland expressed his approval of Lune when he inspected it for the Board of Trade during the summer of 1861. With three locomotives and their tenders on each line, it happily resisted a rolling weight of 250 tonnes. A century-and-a-half later and four decades after the last train rumbled across it, the viaduct remains in respectable condition. That said, it’s fair to presume that we’d all need a little care and attention after battling 147 wild winters. And it makes sense to take action before warning signs become problems, particularly with a listed structure. Emerging issues are flagged up by annual visual examinations and detailed ‘touch’ surveys which, on BRB(R)’s viaducts, are carried out every six years. These help to determine what, if any, physical works are required. A suspended cradle provides access to the soffit of each arch. 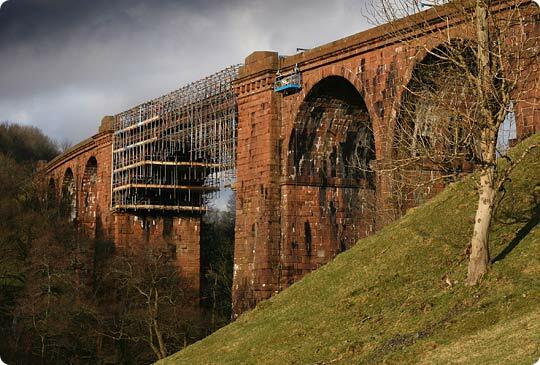 The Lune project involved three main strands - waterproofing and drainage work, assorted repairs to the masonry as well as fresh paint for the main span. For five years, contractor Raynesway Construction has held a framework contract for the Board’s ventures in Scotland - this was its first incursion south of the border. In that time, the company has completed 28 major projects and around 250 minor ones. Arguably its most challenging was the removal of three stone piers standing in a tidal estuary near Kirkcudbright, just downstream of a hydro-electric plant’s dam. Despite the demands of its work, not one reportable injury has been suffered in five years - an exemplary safety record of which Raynesway is justly proud. Refreshingly, the sludge-like processes through which railway contractors are forced to wade have not yet found their way here. However, disused structures cause their own headaches. Access is always the most painful - plant and materials can’t come in by rail of course. Wilderness is the setting for many of these relics. Although their former trackbeds seem the most obvious of potential approach routes, they are often blocked by infill or thoughtless development. lateral forces on the structure. By a stroke of good fortune, Lune benefits from a road which runs past the old formation 100 yards north of the structure. That’s where the compound was located. The central arch has long since lost its deck so amongst Raynesway’s early tasks was to construct a temporary one. Such is the local geography that, without it, a trip to the southern abutment would have involved a mile-and-a-half drive and 800-yard cross-country hike. 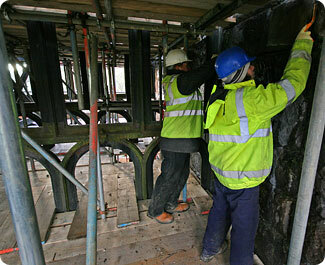 Painters operated from a multi-level scaffold which was draped around the ironwork. Only a third of it could be encapsulated at any one time as, otherwise, the sheeting could have acted as a sail and, in seasonal gales, applied excessive lateral forces to the structure. The arch is made up of four girder assemblies - each was grit-blasted and given new paintwork. Despite being a like-for-like upgrade, an approving nod still had to be secured for the specific shade of black (and there are several of them) from the relevant authorities. This was not as simple as it sounds. Although Lune sits within the administrative patch of South Lakeland District Council, the Yorkshire Dales National Park boundary runs up the middle of the river, giving it powers over the viaduct’s southern half. Both bodies consult widely on such projects and Lune was no exception: views were sought from the Georgian Group, English Heritage, the Ancient Monuments Society, the Council for British Archaeology, Natural England and the Victorian Society, to name just six. The wheels of officialdom do not turn quickly. to accommodate the grit-blasting and repainting work. Repairs and improvements were carried out on the drainage system, focussing on downpipes and dissipation pits. Allied to this, the surface of the deck was removed and a Hytec waterproofing membrane fitted. This should afford protection for the next 25 years. The works programme was designed so as not to disturb resident ravens which tend to start egg-laying in late-February. Bats had to be considered too. It was no surprise that despite the masonry’s high quality, clusters of vegetation had managed to secure a hold. These were removed and their remnants treated. Open mortar joints also received attention. 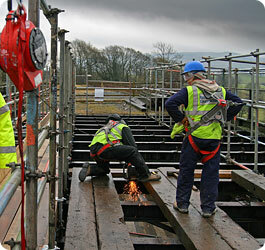 To repoint parapets, piers and spandrels, the team employed cradles suspended from motorised cantilever jibs. A similar technique allowed access to the piers’ inside faces and arch soffit, except the cradle was slung beneath the span and held by wire ropes from both sides of the structure. 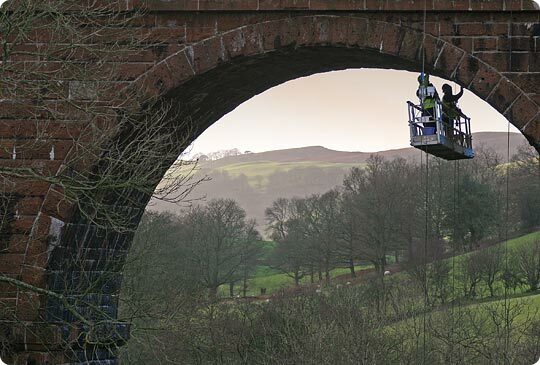 During May, the Lune valley’s viaduct was fully unwrapped: scaffolding gone, roadway removed, surface reinstated. Palisade fencing - vital to deter illegal abseiling and bridge jumping - now protects the foolish from themselves. Those who care to look can marvel at the audacity of this structure’s Victorian creators and thank today’s guardians for ensuring its continued health. The landscape of South Cumbria is richer for its presence; even more so when the sun puts in an appearance.